Search results for "Claes Oldenburg"
In an effort to consolidate its efforts in Los Angeles, Google has leased 100,000 square feet of office space in three buildings in Venice, including space inside Frank Gehry's Chiat/Day Building, a.k.a. the Binoculars Building. Why is it called that? 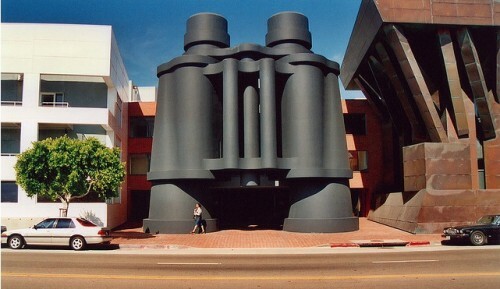 Because one entryway is shaped like a gigantic pair of binoculars, of course. Finished in 1991 on Main Street, the space is probably the most famous of Gehry's forays into...shiver... Post Modernism. The binoculars themselves were designed by Claes Oldenburg and Coosje van Bruggen. The new Venice Googleplex will hold many more employees than its present collection of buildings in Santa Monica, which contain about 300. Earlier this week Google announced that it would be adding 6,000 total employees this year. Recession? What recession? Not in Google's world. “Architecture,” Dan Graham claims, “is my favorite hobby,” and his work has long been a source of inspiration and ideas for architects from Herzog and de Meuron to SANAA. The most comprehensive American exhibition of his art went on view today at the Whitney Museum, through October 11. Curated by Chrisse Iles and Bennett Simpson, Dan Graham: Beyond takes up the entire fourth floor of the museum, and given this space’s natural lighting, it is the perfect venue for Graham’s iconic reflective glass and metal structures. Though Graham claims he was “never a conceptual artist,” the work he produced during the 1960s—and labeled conceptual by Lucy Lippard—is perhaps the revelation of the show. They are buried in cave-like rooms on the back of the fourth floor, and began Graham’s lifelong interest in the culture of everyday life. If this is not enough Graham for you, the catalogue includes some of his critical writings on art, architecture, and rock and roll, along with a cute manga by Fumihiro Nonomuro. The exhibit will feature accompanying lectures and discussions, including one with the musician Glenn Branca, whom Graham has championed for decades. PS – While you’re there, take a relaxing break from Grahamiana and visit the Whitney’s excellent Claes Oldenburg show, which closes on September 6. 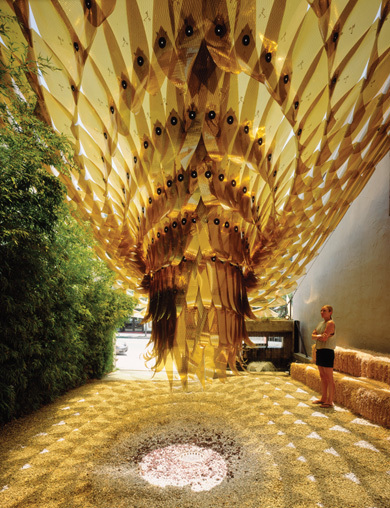 PPS – And also don't miss the nice installation LA's Jeffery Inaba just did at the old DIA space on West 22nd Street. Graham used to have an installation up there, before the arts foundation sold the place in 2004. But hurry, because the new piece is only there through Saturday. Las Vegas has become a barometer for architecture, though it’s usually a little bit behind the times. It was all glamorous modernism in the 1970s, but by the 1990s, local developers here were obsessed with postmodern fancies that brought the world close, and down to size: The Venetian had its own Grand Canal, and the Paris arrived with a scaled-down Eiffel Tower, while New York, New York went so far as to put maintenance staff in uniforms like those worn by Sanitation workers in the five boroughs. At the turn of the century, developers moved toward upscale, lifestyle-oriented resorts and boutique hotels like the Wynn and the Hotel at Mandalay Bay. Now another shift is underway: The MGM CityCenter, still under construction, is creating iconic buildings in a dense, mixed-use environment. Believe it or not, Vegas is selling urbanism—or at least a local version of it—and taking a page from cities around the world by using big-name contemporary architects to generate interest. 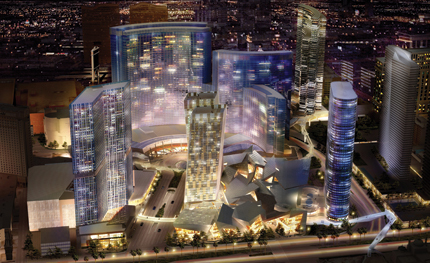 The $7.8 billion, 18-million-square-foot CityCenter will be in the middle of the Las Vegas Strip (on the site of the former Boardwalk Hotel and Casino), and is set to open next year. Touted as the largest privately funded development in U.S. history, it will include hotel, casino, residential, cultural, retail, and entertainment uses connected via indoor and outdoor pedestrian passageways. The major buildings were designed by Daniel Libeskind, Rafael Viñoly, Helmut Jahn, Foster + Partners, Kohn Pedersen Fox, Pelli Clarke Pelli, and the Rockwell Group, with Gensler as the executive architect, and Ehrenkrantz Eckstut & Kuhn as master planner. The marquee names continue to the art program, which will include work by Maya Lin, Jenny Holzer, Nancy Rubins, Claes Oldenburg and Coosje van Bruggen, Frank Stella, and Henry Moore. 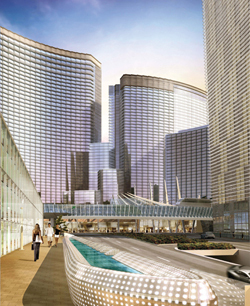 CITYCENTER UNDER CONSTRUCTION IN late MAY (TOP) AND AS RENDERED (ABOVE), with the adjacent monte carlo casino at far left. 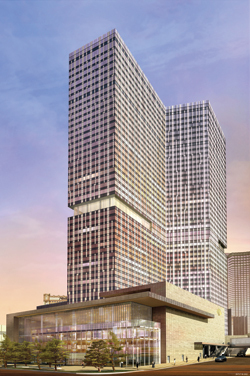 While CityCenter’s 76-acre site measures about the same as most of MGM Mirage’s properties, it will be about three times as dense, said Sven Van Assche, vice president of design for MGM Mirage Design Group. 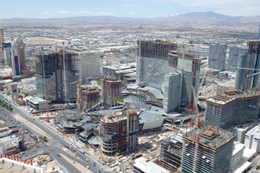 The push for density was first necessitated by economic conditions: The sharp rise in land prices in the city forced planners at MGM Mirage (which owns a number of Vegas casinos including the Bellagio, the MGM, and the Excalibur) to consider other revenue sources when they first conceived the project in 2004. “We quickly realized we were getting ourselves into a very urban condition,” said Van Assche. Mixing uses, he pointed out, is not new in Vegas, and most developments now contain hotels, casinos, retail, and even condos. But nowhere is that mix so tightly packed, so large, and so full of programmatic variety. The interaction of the architects, said J.F. Finn, managing director at Gensler Nevada, started out with very few guidelines, but once a vision began to emerge, planners started to rein things in. Working with so many designers helped spur what Finn termed “happy accidents,” like the plaza between the casino and the Crystal. That came about when designers decided that Pelli and Libeskind’s buildings should have some breathing room. Likewise, a charrette between Libeskind and Jahn helped change their respective projects from one unified, mixed-use building to two very distinct entities. All seven buildings will be connected by a meandering network of walkways that meet at larger nodes, usually marked with public art or a water feature. “We wanted to create places where people could gather that weren’t near slot machines,” said Finn, in explaining the nature of these nodes. 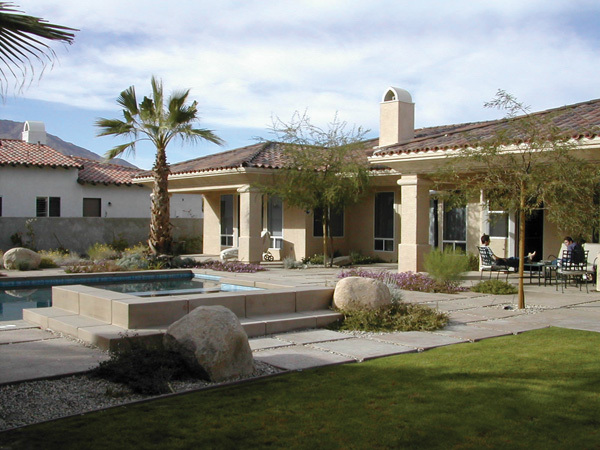 Because of Vegas’ temperature, he added, the majority of these passages will be indoors, although a few outdoor walkways and bridges, landscaped with varied greenery, will act as connectors. Is this urbanism? Finn argues that it is, and points to the functionally indoor nature of projects in other extreme climates like Abu Dhabi and Dubai. 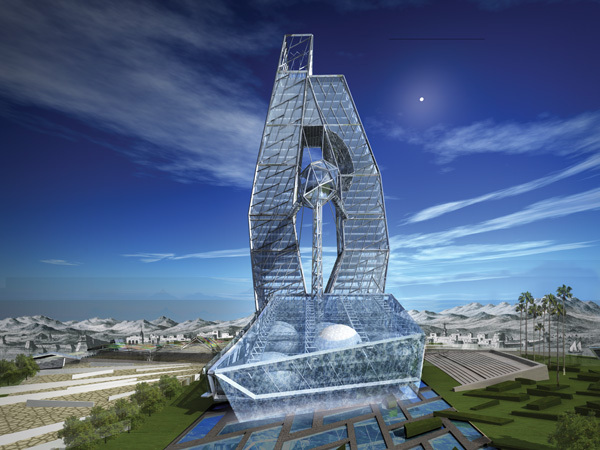 Libeskind’s project was originally planned to be outdoors until the team realized it was not feasible. Still, having a retail project at the very front of a development in Vegas is rare. Inside it will resemble a small city with large public spaces, curving walkways, and changes in scale from small nooks to a 200-foot-high grand stair. 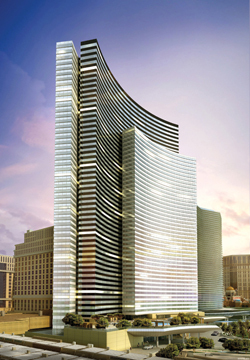 Van Assche and Finn both noted that other Vegas developers are looking at mixed-use and iconic buildings. Boyd Gaming’s Echelon will contain five separate hotels, 9,000 square feet of retail, and two large theaters. The newly-opened Planet Hollywood has a massive retail complex at its front door, and Harrah’s is reportedly considering a mixed-use, multi-building mega-development as well. “I think it’s the evolution of where the city is going to go,” said Van Assche. 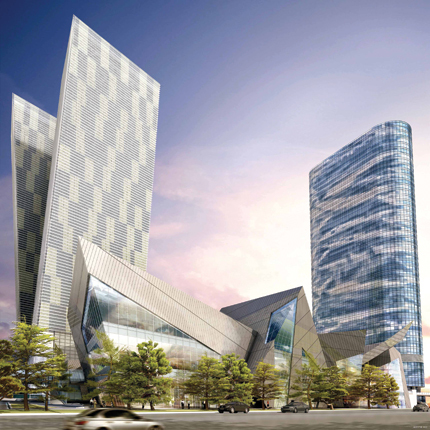 Like anything in Vegas, CityCenter’s goal is to attract attention and stand out from the pack. And so it appears that like the flashing neon signs before them, the pyramids and Grand Canals will give way to Libeskind’s jagged steel forms and Jahn’s diagonal towers, the newest icons in a city full of them. Sam Lubell is the California editor of AN. With all the blinking lights, splashing fountains, and blasting air-conditioners, Las Vegas is probably at the bottom of any list of places one would associate with sustainable design. But with rising energy costs and environmental awareness becoming increasingly mainstream, CityCenter hopes to be a model for green thinking in Sin City. Though all the buildings at CityCenter will seek LEED certification, most of their sustainable features are conventional and relatively modest: low-VOC paints, extensive use of daylighting, low-flow plumbing fixtures, and drip-irrigation for the landscaping. Like the city’s privatized monorail, however, sometimes large-scale private development can yield green results through the creation of efficient infrastructure. Much of the development’s energy will be generated at an on-site cogeneration plant. The plant will recycle the heat generated by producing electricity for the hot water used throughout the complex. Moonlighting has been around since the dawn of work, and architects are certainly no strangers to the phenomenon. From large, high-profile firms to small offices with just a handful of employees, architects often take unofficial jobs on the side to pay the bills, to climb the corporate ladder, or to simply find a creative outlet beyond the desktop of their workplace. Many claim that it has always been part of the culture in the architecture world, while others say there is a rise in moonlighting due to the downturn in the economy and heightened competition in the architecture job world. Firm jobs are still vital for most financially. But with boring CAD duty a rite of passage, and salaries not rising with the cost of living, working at a firm is often not enough. For young architects, moonlighting may feel like the only way to get ahead. Tom Newman, of Newman & Wolen Design, said that wherever he had worked before opening his own firm had had no-moonlighting policies—but that never stopped anyone. “I did it and everyone else did it,” he said. “It was the only way to have some creative control and get through the drudgery you dealt with every day.” But he also admitted that it was the years hunkered down in large firms that gave him the backbone and experience necessary to eventually open his own firm. “You certainly don’t get a lot of practical experience squeezing out small garage renovations on the side, although you may make a little extra money doing them,” he said. Benjamin Ball, an architect and co-partner of Ball-Nogues Studio, moonlit for nine months while working at a small architecture firm in Santa Monica. 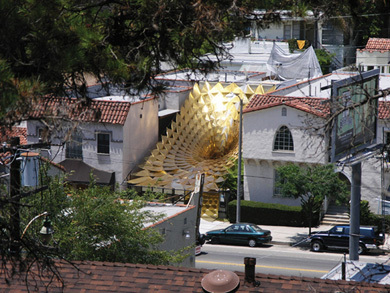 He spent most of his nights and weekends working on Maximilian’s Schell, a massive, vortex-shaped installation made of mylar that was showcased at Materials & Applications, a gallery in Silverlake, a few years ago. Nogues, his partner, worked for Frank Gehry and admitted that he shied away from moonlighting while working for the large firm, except for once—when Gehry himself set him up with some outside work. Mohamed Sharif, president of the Los Angeles Forum for Architecture and Urban Design and an associate at the Santa Monica firm Koning Eizenberg, added that moonlighting is even more prevalent now in LA due to the surge of single-family upgrades in the last five to ten years, providing plenty of small jobs, most of them done on the side. Despite its prevalence, moonlighting can often be a source of serious anxiety and burnout, especially for those doing it without permission. An architect who works for a small firm in Silverlake who preferred to remain nameless said that moonlighting was a source of constant angst for him. “I think in my firm they like to imagine that the focus is always on them and that there is nothing else going on in anyone’s life,” he admitted. He would often run out at lunch time for client meetings, and for the last two years said he worked consistently until midnight, even on weekends, to get all of his work done. “I think the office job is the necessary evil. The other jobs on the side are the creative outlet,” he said. Firms, meanwhile, take very different approaches to moonlighters. Some encourage it as a useful tool for younger architects, while others often see it as tantamount to cheating. Steve Kanner of Kanner Architects, based in Santa Monica, has been in the business for 27 years, and admits to moonlighting’s prevalence. He uses it as an incentive. “I get at least a few calls a month for work that isn’t right for this firm and I’m happy to pass it along to our newer architects,” he said. He did admit that he is careful in terms of liability, and always writes a letter divorcing Kanner Architects from responsibility. 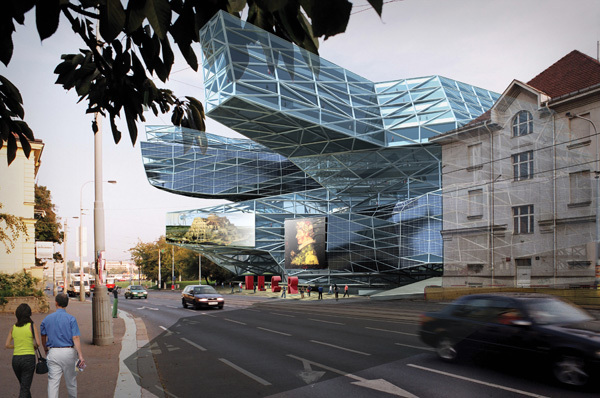 “I think to limit architects and put them in a box is counterintuitive. Allowing architects to work on other projects if they have time creates more passion for the work, and ultimately a happier employee.” He was quick to add that he has never felt taken advantage of in the process of giving an employee additional work. When Ball and Nogues are in a position to hire employees for large projects and installations, Ball openly admits that he prefers to hire moonlighters. “I guess I’m the guy that the large, more corporate firms hate,” he said. “But since we can’t offer full-time work, we like to hire people that are working in other places who can bring cutting-edge skills to the table,” he said. “If I were working in a large firm drafting toilets all day long, I think I’d really like to work for me,” he added. 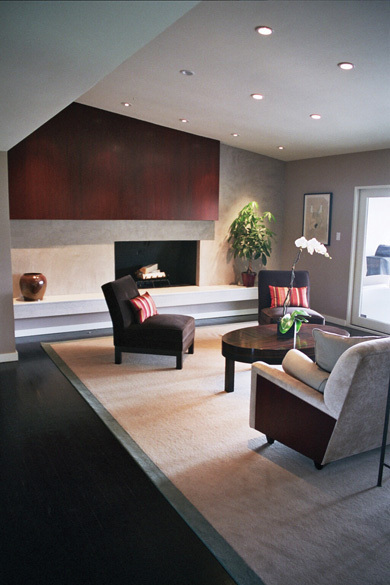 Hraztan S. Zeitlian, AIA, director of design at Leo A Daly, understands the impulse to moonlight, but is against it. In his opinion, once you are working for a firm and take on other jobs for profit, you have crossed a line. Prior to joining Leo A Daly, he started a “think tank” for his more creative, not-for-profit architectural pursuits, called Struere (www.struere.com) where he spent outside time developing incredibly experimental schemes. His proposals for a library in Prague and a high rise in Saudi Arabia have won awards from the AIA Los Angeles and the Chicago Athenaeum. “I think this is a very non-traditional way to advance architecture,” he said. “Other than academia and a handful of boutique firms, there are very few places to do highly experimental work. We need to encourage experimentation, but find honest ways of doing it,” he added.